The PC-based Logic Analyzers communicate with laptops or desktop PCs by USB. They offer high speed clock rates, deep buffers, and sophisticated triggering. The LA-5000 Logic Analyzers are available in 40, 80 and 160 channel versions. The Windows software makes it easy to use the Logic Analyzer. Sharing data and printing are a mouse click away. Save and export to Excel, Word, Mathcad, etc. The software allows users to change channel order, size, position, and color. Individual pulse width and frequency information can also be displayed. The software translates and displays captured I2C commands. What makes this product superior to other I2C monitors, is the ability to see all activity on the Clock and Data lines in Timing and Statelist display, not just the valid codes. 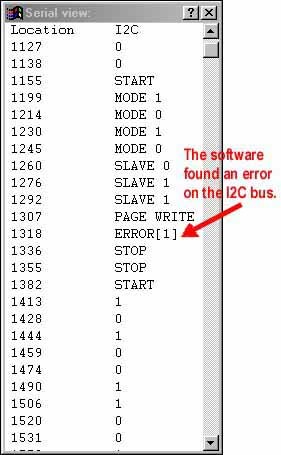 In addition to capturing I2C data, the Pattern Generator can be used to output I2C commands to stimulate a circuit. Each logic analyzer channel can display up to 7 unique pulse parameter measurements. In theory, one would need to capture at twice their sample rate. However, in reality, the capture speed needs to be much faster than that. Our Analyzers provide up to 500 MSa/s clock rates for accurate and detailed capture. Our buffer allows for storage of a great number of events. In some scenarios, it is difficult to pinpoint the exact event that needs to be triggered on. With our system, it is not necessary to know exactly where to trigger, since our large buffer will capture so many events. Our LA-5000 can capture long events that other analyzers may cut off. Users can also maintain higher sampling rates to get more detail without running out of buffer space. The optional 100 Mpt/s Pattern Generator pods allow users to configure the LA as a Pattern Generator. The output patterns can be created with our software, loaded from a file, or acquired through the input channels. Our Logic Analyzer captures what is important. The 16 level triggering (up to 160 bits each) lets one fine tune the exact point to start capturing. Multilevel triggering can be used to look for a sequence of events (i.e. address xxxx1110xx111x0x followed by address 11xx1110xx111x0x). The LA-5000 Logic Analyzers connect to desktop or laptop computers by USB. One end of the wire harness plugs into the IO-3200, and the other has connectors for 8 channels and grounds. The wires can be connected directly to 0.025" posts on a test circuit or to our test clips. The optional Nano-clips allow users to connect to very small surface mount pins. Optically isolated input range extenders for monitoring industrial process controllers. In order to write their own software to drive the unit, users can buy our optional DLL library. The DLL was written in Visual C++ and includes a sample program that allows for the configuration of the LA and PG channels, data-capture, and transferal the PC. Inputs are clamped through a 200 KΩ resistor. ± 150 V Continuous, 250 V Trans. Any of the inputs can be used.